Set of 5 Accessories. 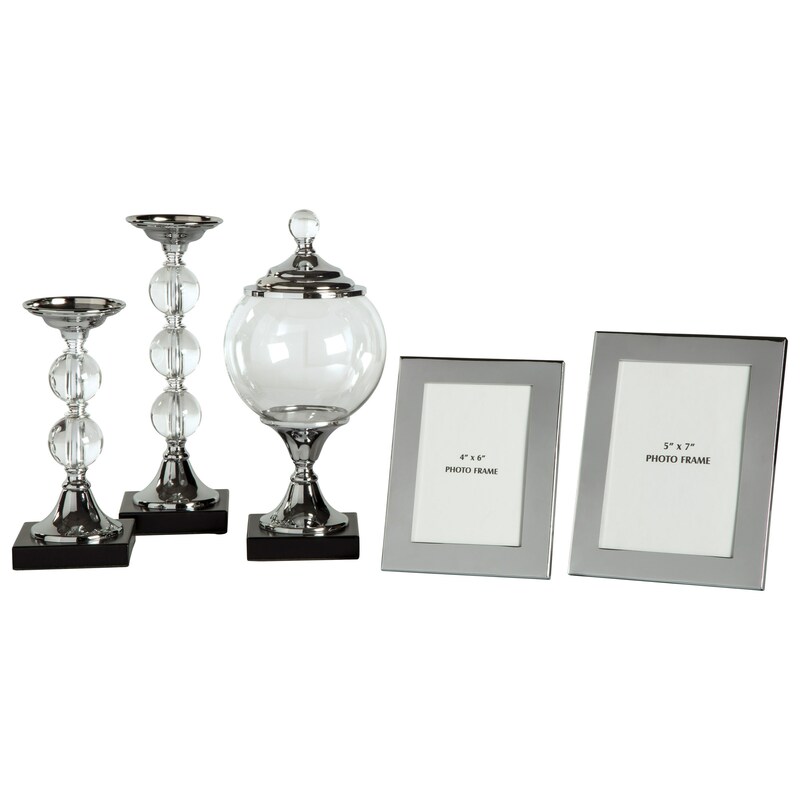 Box, 2 Candle Holders (Candles Not Included) and 2 Photo Frames (4" x 6" and 5" x 7"). Crystal, Glass and Silver Finished Metal. 4"x6" photo frame 6.00" x 4.50" x 7.50"
5"x7" photo frame 7.00" x 5.75" x 8.25"
Candle holder-small 4.00" x 4.00" x 9.25"
Candle holder-large 4.00" x 4.00" x 11.50"
Box 6.00" x 6.00" x 12.50"
The Accents 5-Piece Diella Silver Finish Accessory Set by Signature Design by Ashley at Household Furniture in the El Paso & Horizon City, TX area. Product availability may vary. Contact us for the most current availability on this product. The Accents collection is a great option if you are looking for Relaxed Vintage Transitional Accents in the El Paso & Horizon City, TX area. Browse other items in the Accents collection from Household Furniture in the El Paso & Horizon City, TX area.